"They are good people. They are honest and straight up about what's wrong. They do great work." It was pretty good. I had a pretty good experience. Above average. The employees seemed very nice and efficient. Pretty quick in and out. It was very quick. They explained what they did. They were considerate to my time span. I told them I just wanted the oil changed and they got right on it. Most of the time I go to get my oil changed. They go above and beyond, they see what else I need to do. The little things we may not notice but may help down the road. The last time I was there the guy said 'I will replace your tires, the side is worn out.' They are not just for the business, they are for the customers as well. I would say it is a well-established business. They do well with their customers to fully satisfy them. It was fair. It is a very good shop. They did one service and did a very good job. The only problem was the radio wasn't working, but it turned out to be a fuse. Awesome. Fast efficient, and friendly. Great great great. Very honest I would say. Their prices are reasonable. They pick you up if you have no way picking up the care. Excellent service. They did a very good job. They were informative. They have good people. They are like a family. I feel comfortable and I don't ever have any problems. Everything was very good. It came out perfect. Their work is very fair. I have actually driven customers their way since I was so happy with the work. It's good. I think it was ok because they did what they needed to do. The guy in charge was very helpful. 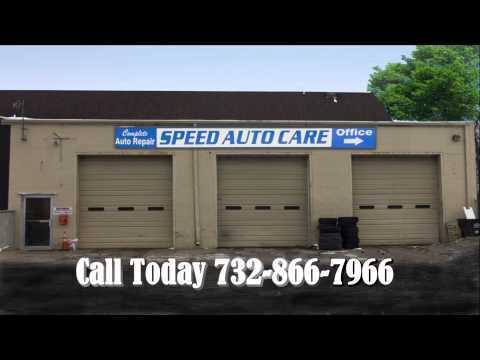 Speed Auto Care has been serving the community of Freehold and the surrounding area since 2012. During this time they have developed a loyal following of satisfied customers who described this shop to us as: "honest”, “courteous”, “accommodating”, “reliable” and "excellent". This location features a team of automotive professionals whose experience and commitment to ongoing training ranks with the best. An investment in the necessary tools and diagnostic equipment helps make them capable of repairs ranging from minor and major mechanical repairs, to check engine light diagnosis and repair, as well as your scheduled maintenance needs. Repairs are covered by a 24-month / 24,000-mile warranty for your peace of mind. A local shuttle service, early bird drop off, Saturday business hours, and a waiting area with wireless Internet are all available for your convenience. We are an auto repair shop serving Freehold and the greater Mounmouth and Ocean counties. We provide everything from oil changes to radiators, to timing belt replacement or brake service for any vehicle. With over 15 years of experience in the automotive service industry we can help with your auto repair needs. We use Original Equipment as well as Delcoâ„¢ and Motorcraftâ„¢ replacement parts. Our services are performed by experienced ASE certified technicians at competitive prices. Come and visit your friendly, trustworthy, neighborhood auto shop. That code repair involves removing and re-installing the transmission which can be expensive. It typically involves a transmission rebuild. Failure of O2 sensor or Evap monitors to run indicates a malfunction. But it may also indicate that the PCM needs to be updated. The vibration can come from either suspension, steering or brakes. It's best to have all three inspected. Most likely a CV axle.